President Maithripala Sirisena concluded a three-day official visit to Pakistan from 22-24 March 2018, where he graced the 78th Pakistan Day Celebrations, as the Chief Foreign Guest, at the invitation of Pakistan President Mamnoon Hussain. President Sirisena was received by President Hussain on arrival at the Noor Khan Airbase, Islamabad, with a 21-gun salute and honour guard by the Pakistan Air Force, on Thursday 22 March. The following day, on Friday, 23 March, President Sirisena took part in the Pakistan Day Celebrations and attended the National Day Military Parade, which included a tri-forces parade, cultural event and air show. In the afternoon, President Maithripala Sirisena had discussions with Pakistan Prime Minister Shahid Khaqan Abbasi on ways and means to further strengthen relations between the two countries. Enhancing trade to reach a target of US $ 1 billion by 2020 was also discussed. Following bilateral discussions, President Sirisena witnessed the signing of three Memoranda of Understanding covering the Training of Diplomats between the Bandaranaike International Diplomatic Training Institute (BIDTI) of Sri Lanka and Foreign Service Academy of Pakistan; in the field of Administration between the Sri Lanka Institute of Development Administration (SLIDA) and the National School of Public Policy (NSPP) of Pakistan; and on Youth Development between Sri Lanka and Pakistan. The Prime Minister of Pakistan hosted a banquet in honour of President Sirisena. During the visit, President Sirisena presented a donation of eye corneas for visually impaired people in Pakistan, under a programme initiated by the Pakistan Sri Lanka Trade and Investment Friendship Association. President Sirisena also took part in the re-opening of the International Buddhist Centre in the Diplomatic Enclave in Islamabad. Following religious observances, the President unveiled a plaque to commemorate and declare open, the re-furbished Centre. Buddhist clergy from Sri Lanka and several representatives from Buddhist countries were present at this occasion. 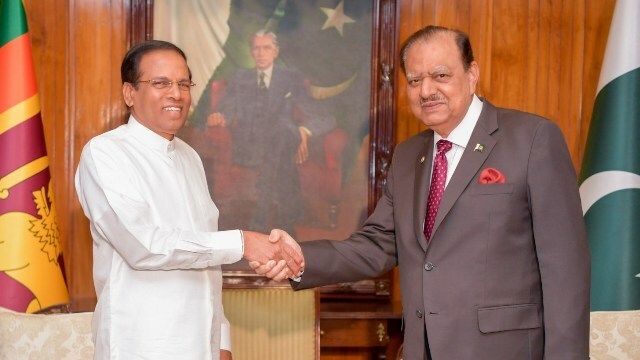 On Saturday, 24 March, President Sirisena met the President of Pakistan Mamnoon Hussain for bilateral discussions. The State Minister of Foreign Affairs Vasantha Senanayake, several Parliamentarians and senior officials accompanied the President on this visit.